Last month, The Berkeley Patriot student organization provoked outrage while trying to organize a Free Speech Week with controversial right wing speakers like Steve Bannon, Ann Coulter, and Milo Yiannopoulos, on University of California, Berkeley campus. The announcement elicited responses from both student and faculty members. In a letter addressed to the UC Berkeley campus and community, 132 campus faculty members called for a complete boycott of classes from Sept. 24 to 27, during Free Speech week. Following the eventual decision to cancel Free Speech Week and simply have Yiannopoulos talk, the Berkeley Patriot, the group who initially planned the events, filed a civil rights complaint that UC Berkeley had failed to take their right to speech seriously. While the event still appears to be cancelled, the conversation around free speech on college campuses continues. 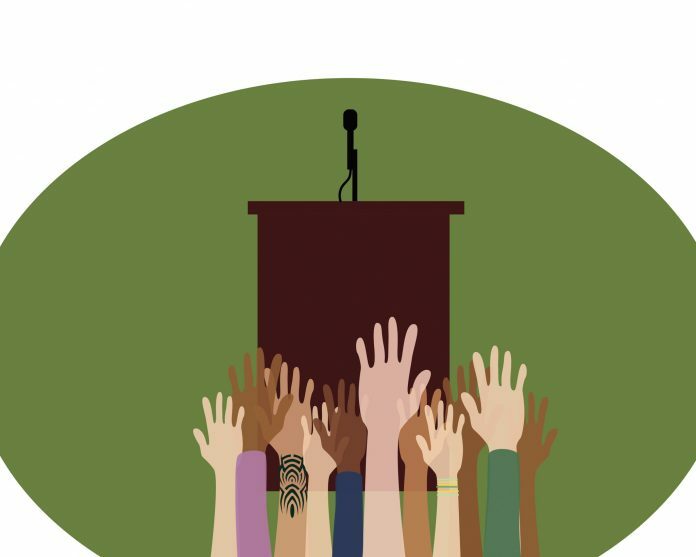 As the new school year begins, University of California, Santa Barbara students will find that many new programs, events, and initiatives are dedicated to engaging the free speech debate. In an interview with The Bottom Line, Vice Chancellor Margaret Klawunn said she has been paying attention to the recent events at UC Berkeley. To help students approach the free speech question, Klawunn started the “Resilient Love in a Time of Hate” campaign in coordination with Professor George Lipsitz and Multicultural Center Director Zaveeni Khan-Marcus. The campaign was initially aimed at maintaining positive spaces in light of an increasingly polarized political climate. Now, Klawunn says she wants to change the name of the campaign to be “Living Lives of Resilient Love in a Time of Hate.” The title change reflects a shift in strategy. The new title is “an effort to show through workshops and programs this year what the practice of resilient love looks like, not just the conceptualization of responding to hate with love but what it looks like when it is a strategy,” according to Klawunn. One of the first programs of the new campaign will be called Community Discussion for Living Lives of Resilient Love in a Time of Hate. The intention of this forum, Klawunn said, is to provide a space for all students, faculty, and community members to come and share what’s on their minds given the myriad issues that are being discussed on a national level. Despite precautions to provide an outlet for free speech-related issues, Vice Chancellor Klawunn said that she doesn’t think that college students are bad at having peaceful, productive dialogue. Rather, she thinks that bringing students and faculty together will create better situations than the examples provided by many public figures. “There are not many models right now for productive dialogue among politicians and public figures, but as a university, we can expect more from each other.” Klawunn said. In an interview with TBL, Dean of Student Life Katya Armistead said she is also working to address campus climate. In addition to having a new position titled Coordinator of Campus Climate and Inclusion Initiative, Armistead says the campus is bringing two organizations to host workshops here at UCSB. The first workshop, hosted by Theater Delta, an organization that tackles issues of diversity and inclusion through hour-long theater performances, will be specifically geared towards the topic of microaggressions. Although faculty members are not required to attend, the workshop will be exclusive to faculty members. With 25 spots for students and 25 for staff, the second workshop, titled The Art of Inclusive Communication, will be hosted by the National Conflict Resource Center. Armistead said that she is very attuned to recent events involving the issue of free speech. While she maintained that she supports free speech, she said she feels that many of the speakers expected to come to campus put a strain on administrators who have to pay for extra security and witness the frustrations of opposing students. “I don’t have a choice. I have to support free speech,” Armistead said when asked whether or not she supports all of the invited speakers. The alternative, she says, is what she hopes the two workshops will provide for UCSB’s community. Rather than resort to violence, Armistead wants students to voice their opinions in a productive way. Community Discussion for Living Lives of Resilient Love in a Time of Hate is scheduled to happen in the Corwin Pavilion from 6 to 7:30 p.m. on Nov. 8. The Theater Delta discussion will be held in Campbell Hall on Wednesday, Oct. 11. All students or faculty members who are interested in attending can contact Katya Armistead at katya.armistead@sa.ucsb.edu. The Art of Inclusive Communication workshop will be held on Oct. 30. The event location is still being finalized.